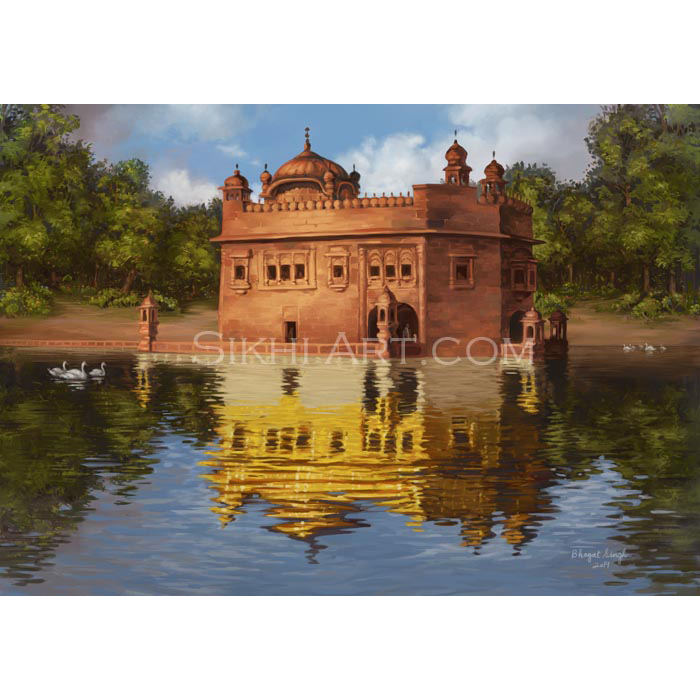 Bhagat uses his gift to create works of Sikh art and Punjabi art that inspire and uplift the soul. His paintings connect the viewer to our ancient Sikh and Punjabi heritage by telling stories of our ancestors in vivid colours. 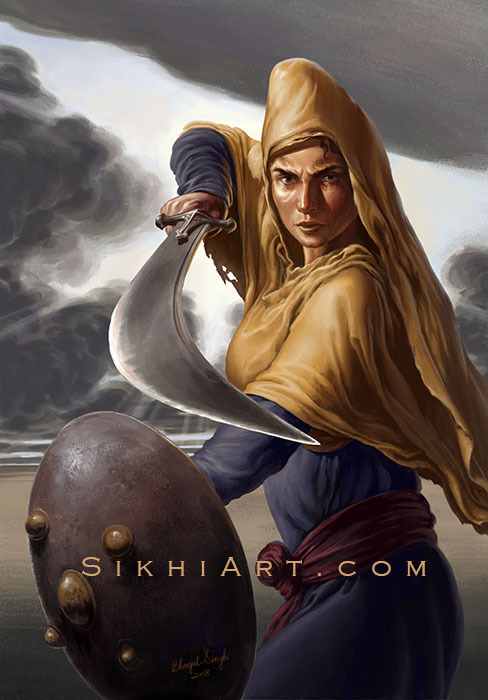 A Sikh strives to be a Warrior-Saint and Bhagat’s paintings embody and emphasize those qualities of Bir Ras and Sant Ras, Warrior Essence and Saint Essence. Each painting is carefully hand-painted, researched and detailed by Bhagat, over years of meditation, and is available as Museum Quality, Premium Canvas and Fine Art Paper Prints. 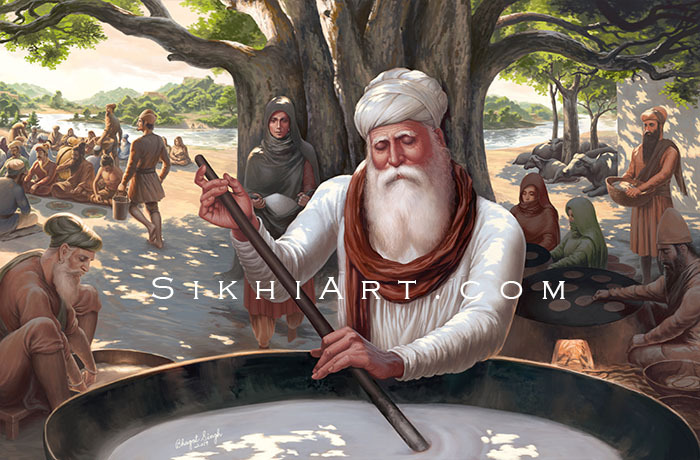 In this painting, Guru Amar Das ji stirs the milk in pure devotion to Hari, while Mata Mansa Devi ji brings forth the rice to add to the milk, to make kheer (pudding). Guru Pita ji provides the spirit and Mata ji provides the material, and together this results in something beautiful. 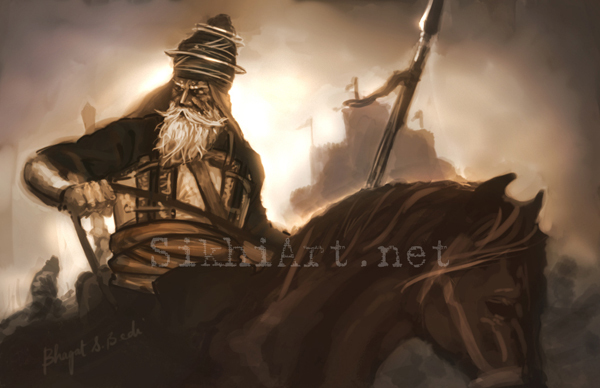 Baba Deep Singh ji rides a Horse named Bali – Sacrifice. He wields a Khanda named Dharma – Responsibility. He holds the Insignia of Gurmati – Guru’s teachings. He wears the Cummerbund of Jat – Self-Control. He wears the Turban of Surti – Awareness – and the turban’s Farla flares above, showing his Mastery over himself and his craft. Together with the Sadh Sangati – the Holy Congregation – Baba ji rides to Mukti – Liberation from the Cycle of Births and Deaths. 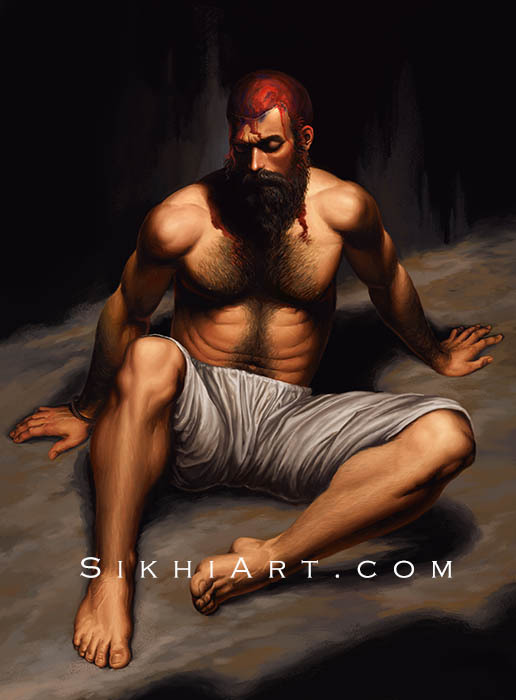 My painting of Bhai Taru Singh ji shows him meditating after his scalp was removed by the Mughal executioner. 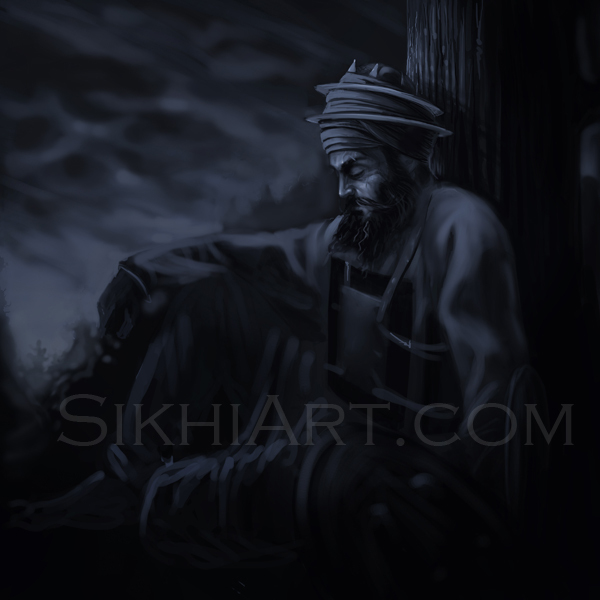 Admist the darkness, Bhai Sahib reclines back as a beacon of light and shows us that the path to enlightenment is to uphold Dharma. 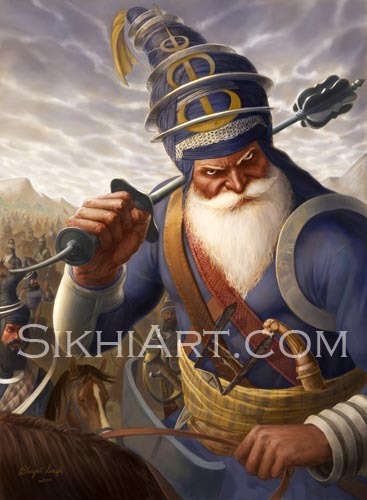 Mai Bhago ji was distressed to hear that a group of 40 Singhs had deserted Guru Gobind Singh ji during the Battle of Anandpur. 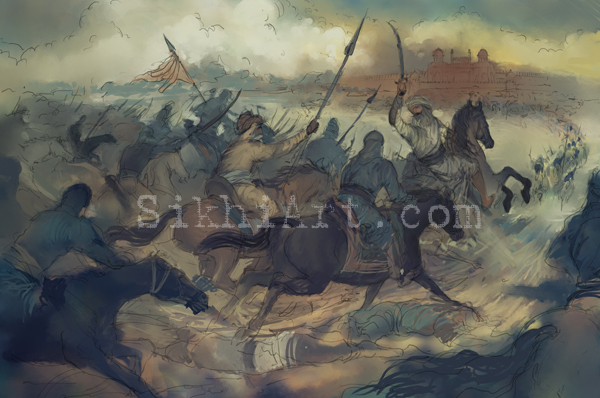 She rode to their gathering, made them realize their mistake and then set off along with them to find Guru Sahib, who was still being followed by the Mughals. 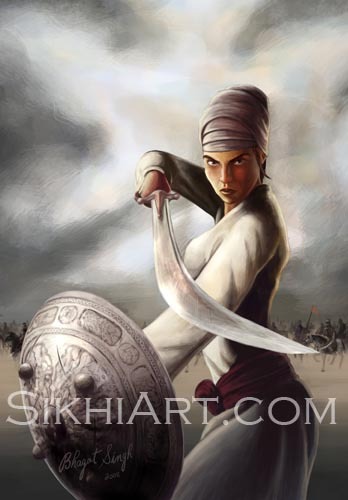 She fought alongside the 40 Sikhs and Guru Gobind Singh ji, in the Battle of Khidrana/Muktsar. This painting developed over time as the result of reading Guru Arjun Dev ji’s bani and feeling the emotions expressed therein. 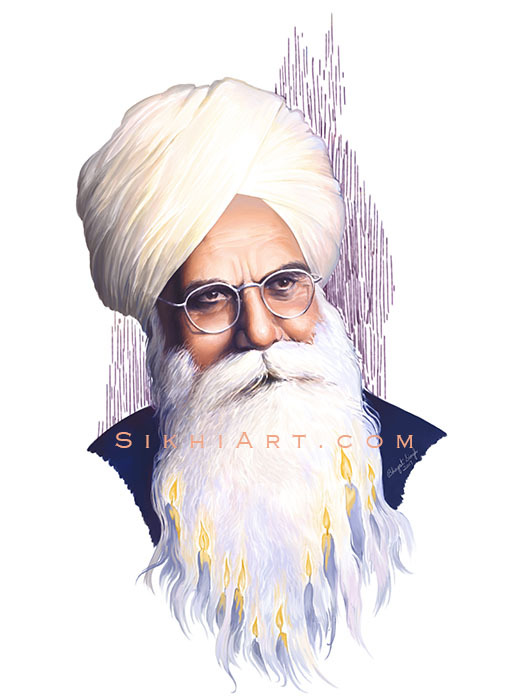 I was moved to tears by the love Guru Maharaj expressed for Akal Purakh Sahib so I just had to create this portrait of my Gurudev. Bhai Vir Singh ji was a giant in Punjabi literature. His works have rejuvenated Punjabi writing and have heavily influenced the Sikh psyche many generations after him. 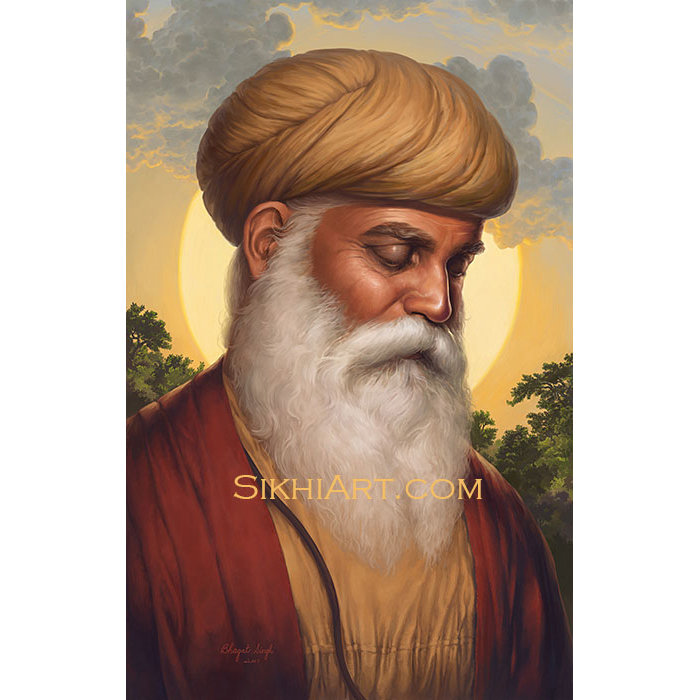 Guru Nanak Dev ji nourishes our soul the way the sun nourishes the trees, plants and all the greenery in the painting. He brings peace to our hearts and gives us wholesome rest in this tiresome world. 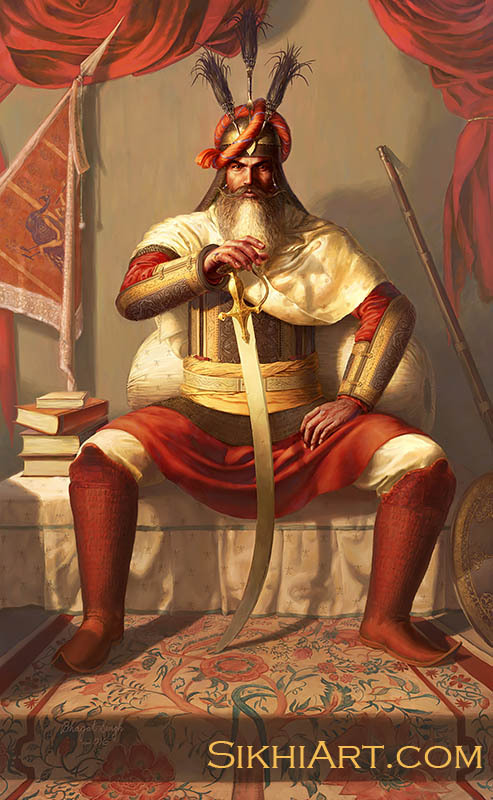 Hari Singh Nalwa was a great general of Maharaja Ranjit Singh’s kingdom. At a young age, while on a hunting trip, he was attacked by a tiger. With his bare hands, he pushed back the tiger, drew his sword and decapitated the beast. He was known for his excellent swordsmanship and chivalry. 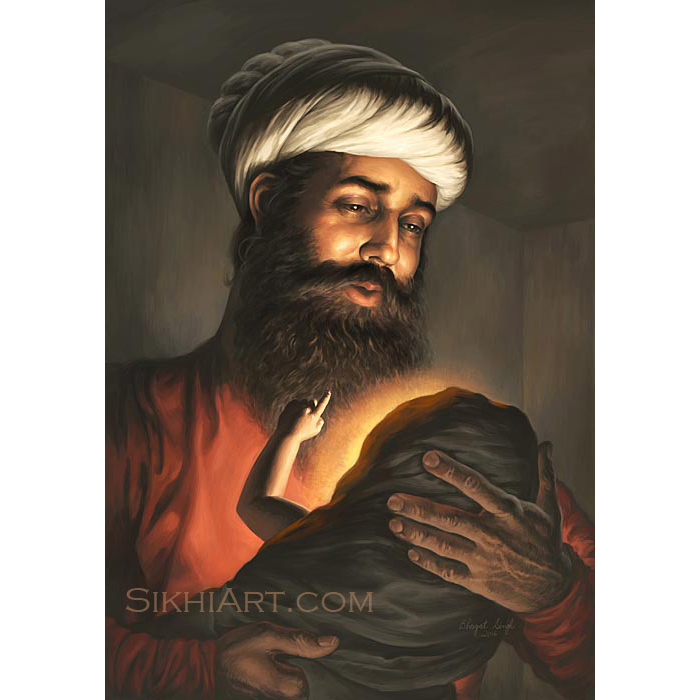 Pita Mehta Kalu ji looks at newly born Baby Nanak’s face, in a peaceful and serene trance state, holding him in his hands for the first time. 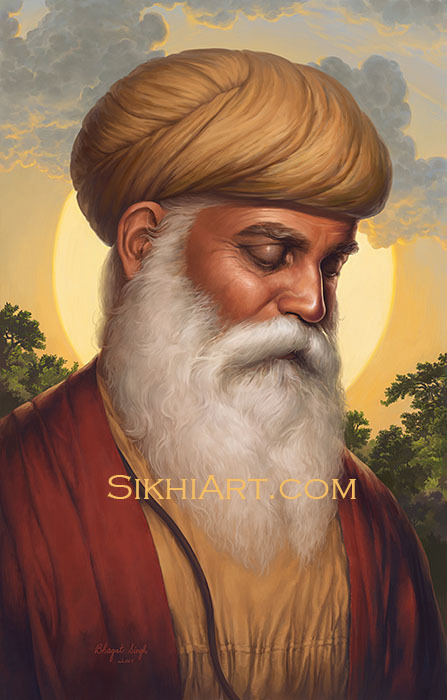 In this painting, I wanted to paint a portrait of Mehta Kalu ji, keeping the main focus on Pita ji, while also showing the light of Guru Nanak Dev ji and his divine arrival on earth. 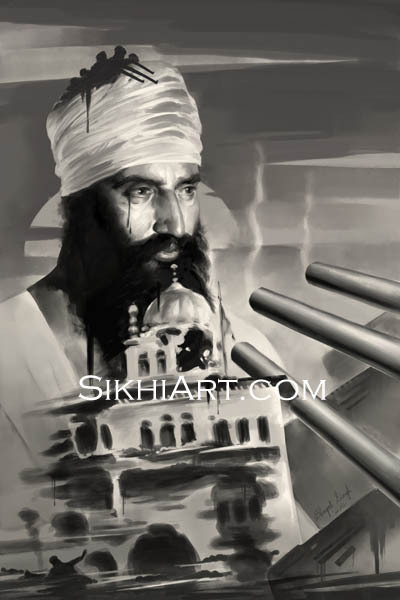 In this painting, Sant Jarnail Singh ji Bhindranwale defends himself against the attacks by the Indian army, who had brought in tanks in order to break through the fortifications put up by Sant Jarnail Singh ji. It was a tragic event that occured in June 1984, where many lost their lives, including the innocent pilgrims who had gathered at the temple to celebrate Guru Arjun Dev ji’s martyrdom. 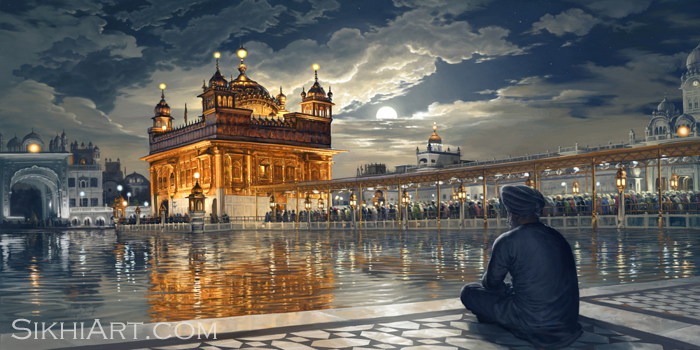 Bhagat’s spiritual painting depicts the radiant Golden Temple in Amritsar, Punjab, under the bright full moon and cool night sky. Amongst the hustle and bustle of the impatient crowd, there is one sikh who sits apart, in eternal patience. The people are giving importance to getting into the temple, whereas this man gives importance to what the temple stands for. In this painting, Dashmesh Pita reflects Akal Purakh’s light, the way the moon reflects the sun, and when we bathe in Guru Sahib’s warmth, we become warm ourselves. 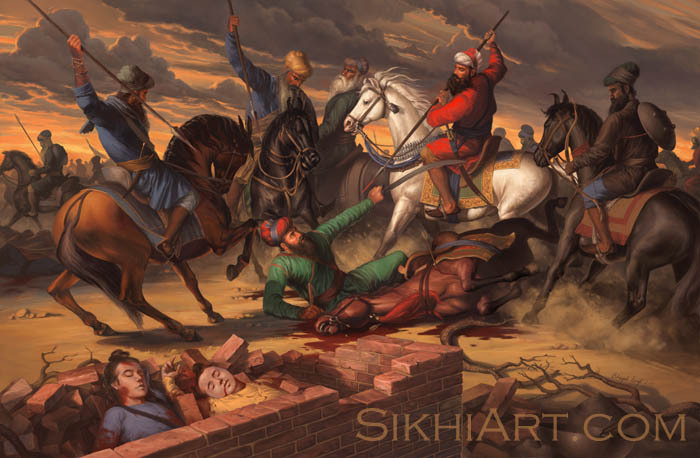 This painting depicts that epic moment when Baba Banda Singh ji Bahadur captures Wazir Khan with a group of Singhs. In order to bring Wazir Khan to justice, Baba ji punishes him for executing the Chotte Sahibzadey. 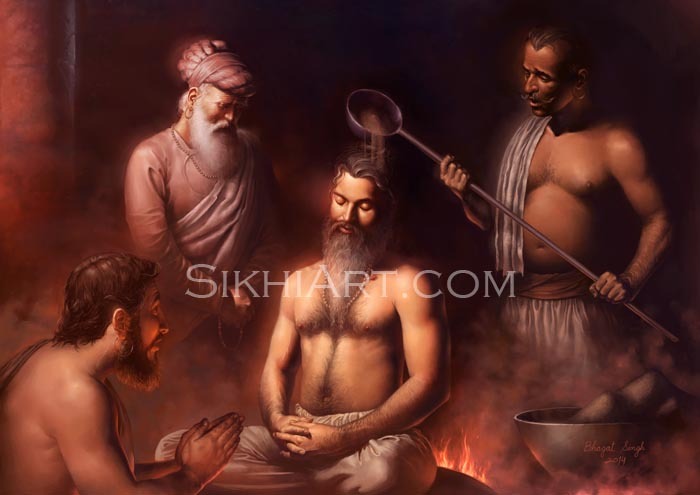 This painting shows Guru Arjan Dev ji peacefully meditating while being tortured. 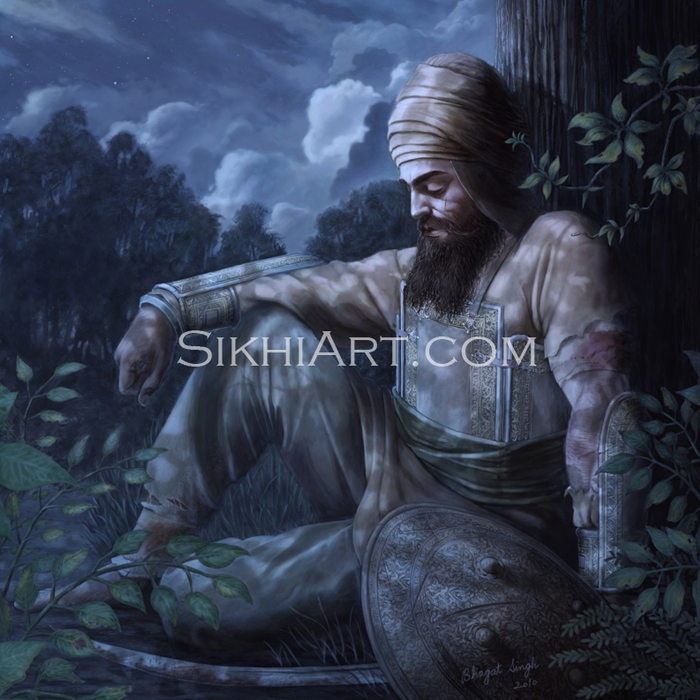 Guru Sahib was made to sit on a hot plate and had hot sand poured over his head and body. Even though he was put through immense pain, he was in profound peace with the moment, with the situation he found himself in. 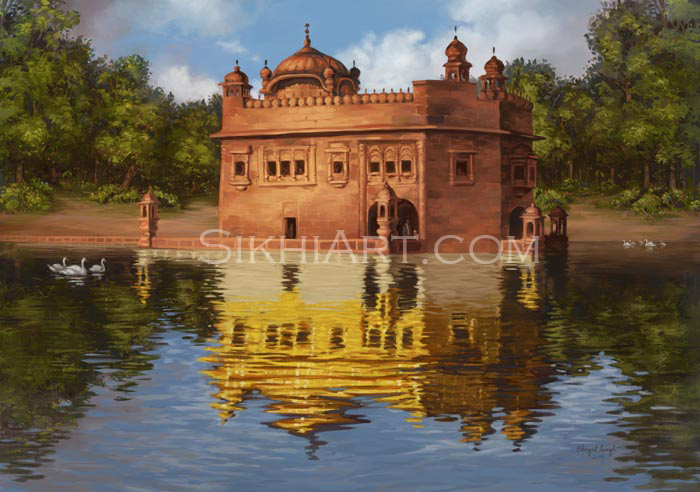 In this painting of the Golden Temple or Harmandir Sahib, I imagine what Shri Harimandir Sahib might have looked like before it was covered in gold and marble. Its humble origins are of mud and brick, surrounded only by a sacred pool (Amritsar), trees and wildlife as it has yet to develop into a large urban community. 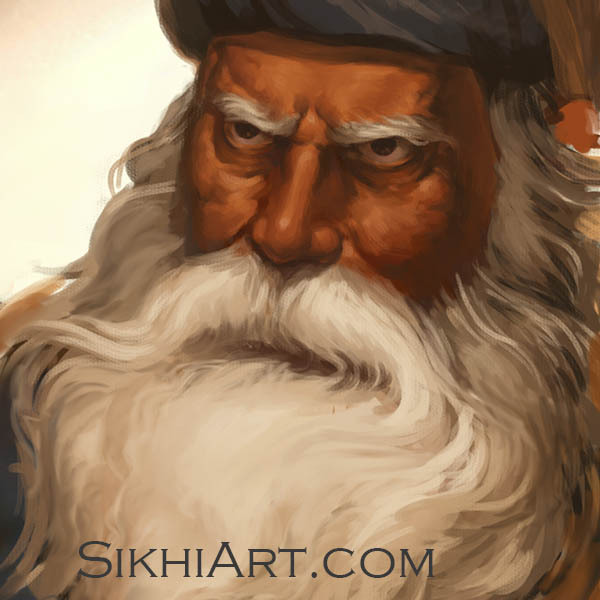 Sneak peak at some of Bhagat’s upcoming Sikh paintings. The final painting may or may not resemble these works. 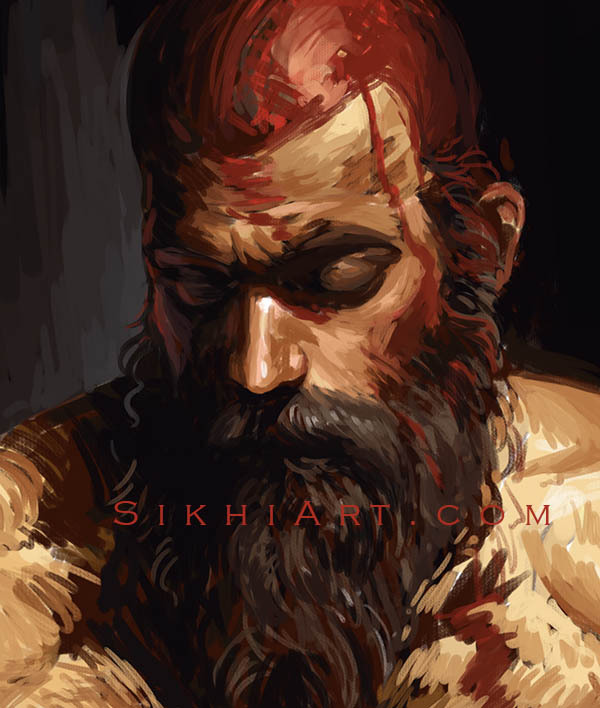 Bhai Taru Singh ji was in his early 20s when his scalp was brutally chopped off for refusing to convert to Islam. 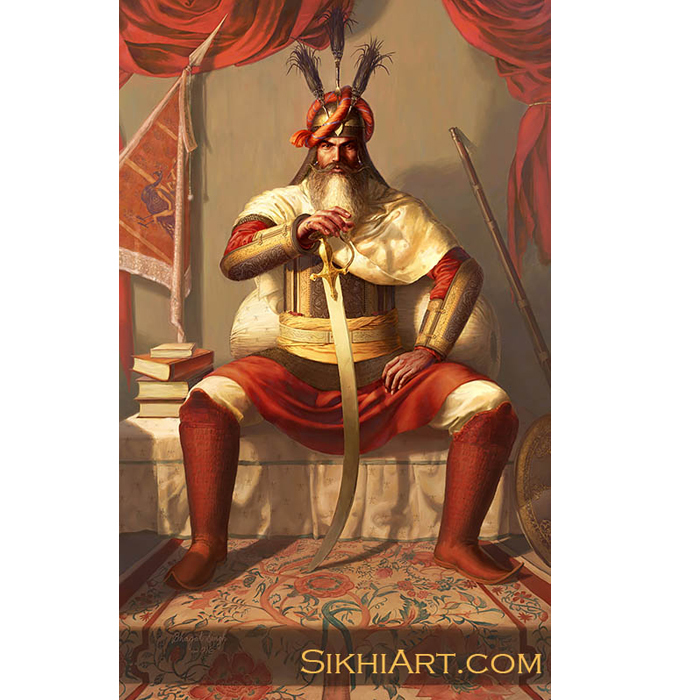 Bhai Sahib maintained the principle of freedom of religion, and maintained his Sikh identity with a lot of grace. This is a close-up shot of the painting in progress. 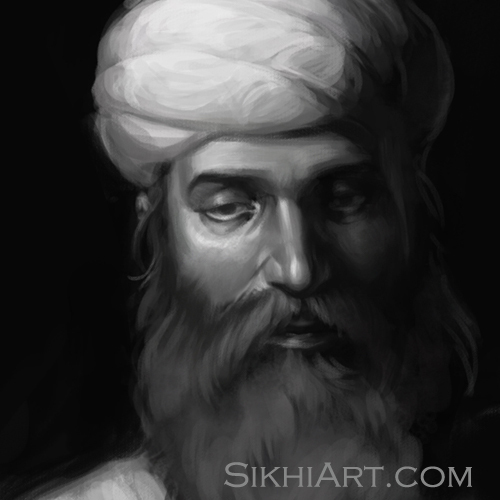 In order to see the full painting, as I work on it, please support Sikhi Art on Patreon. 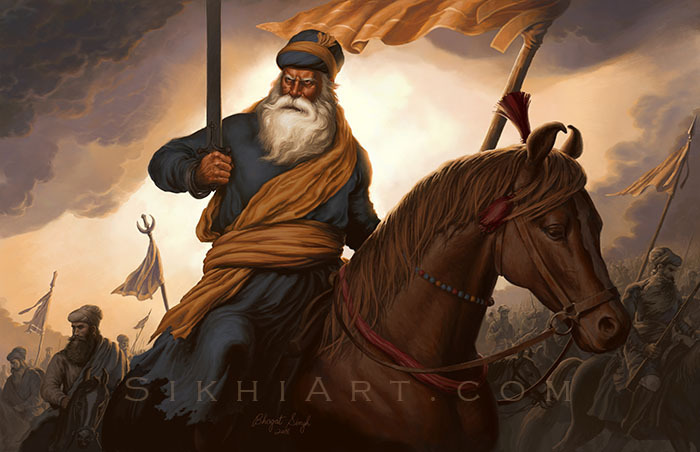 I always wanted to do a painting of Baba Deep Singh ji on horseback, leading an army of Sikhs to defend the Harimandir Sahib. So I repainted one of my previous paintings with a similar theme. 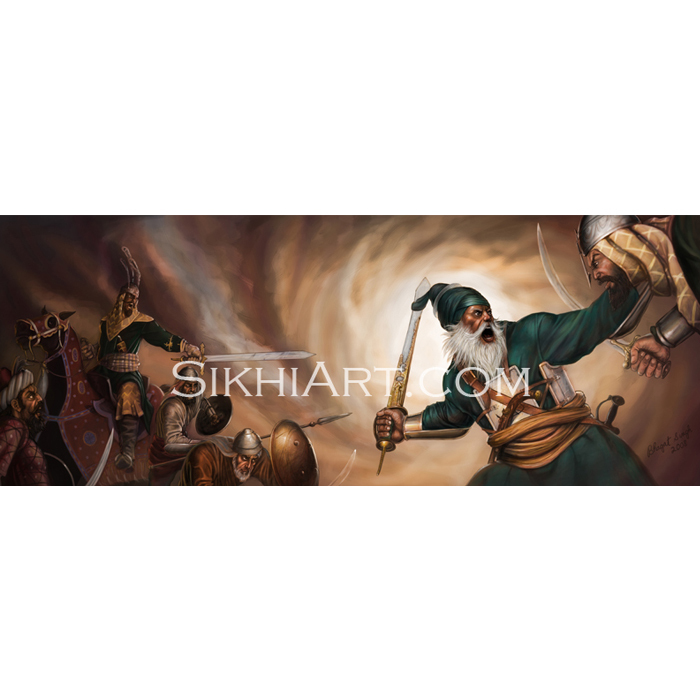 My newest painting is based on puratan paintings of Guru Sahib riding a white horse, surrounded by the Khalsa. Click here to receive a free speed painting print with your purchase. A speed painting is an exercise where the artist uses quick but controlled brush strokes to create a work of art, under a limited amount of time usually 1-3 hours (though some of the recent ones are more like 5-7 hours). Speed paintings can be used to loosen up or even set down an idea for a bigger painting. 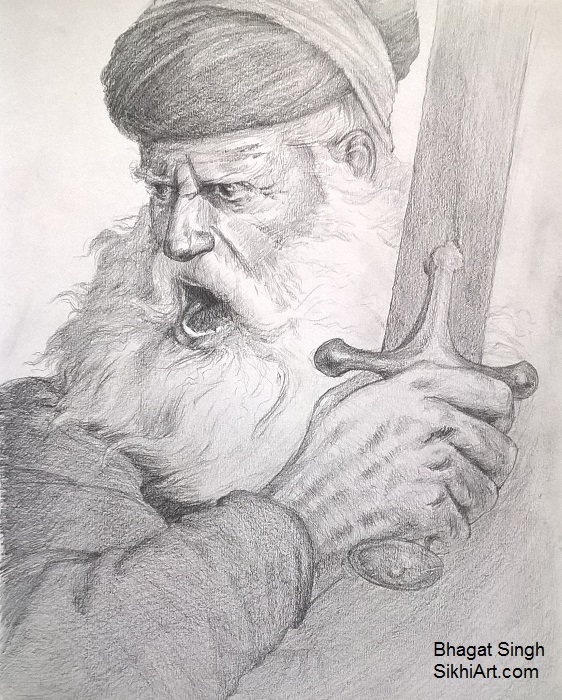 This sketch Bhai Baghel Singh ji leading sikhs to the Red Fort. After capturing Delhi, Bhai Baghel Singh ji built gurudwaras in Delhi dedicated to the Gurus. 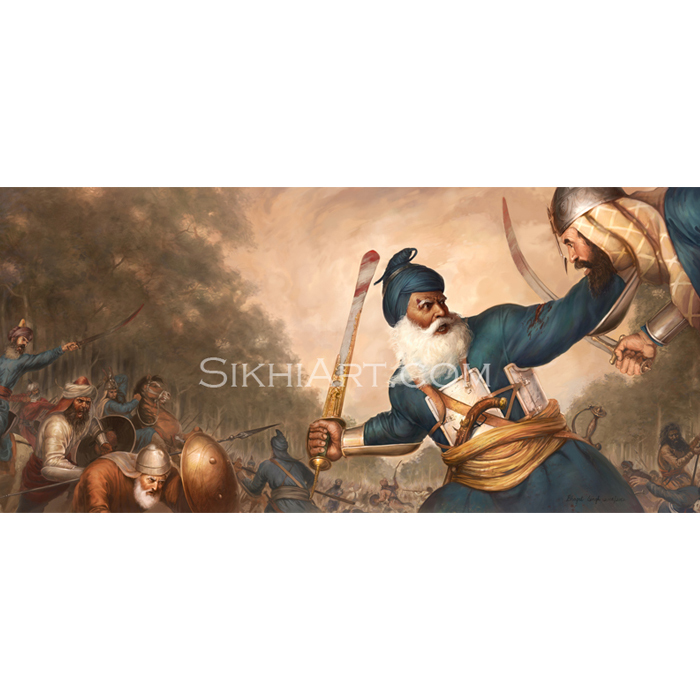 Bhai Ghanaiya ji feeds a Mughal in the midst of a Battle? 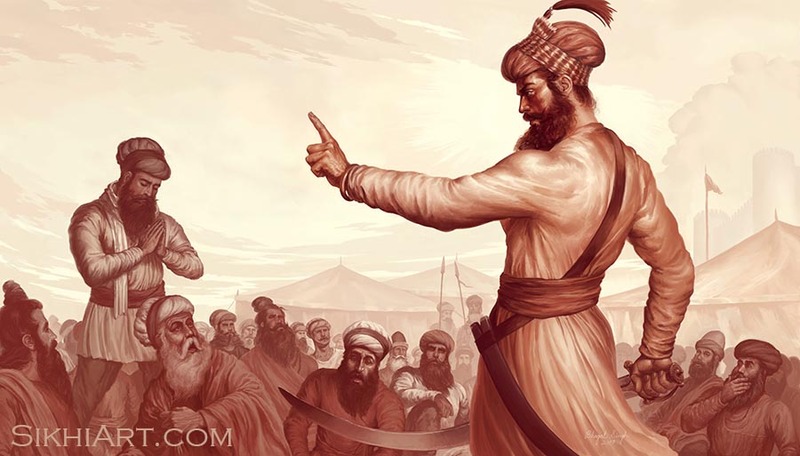 On the day of Vaisakhi, Guru Gobind Singh ji did khande di pahul a little differently. 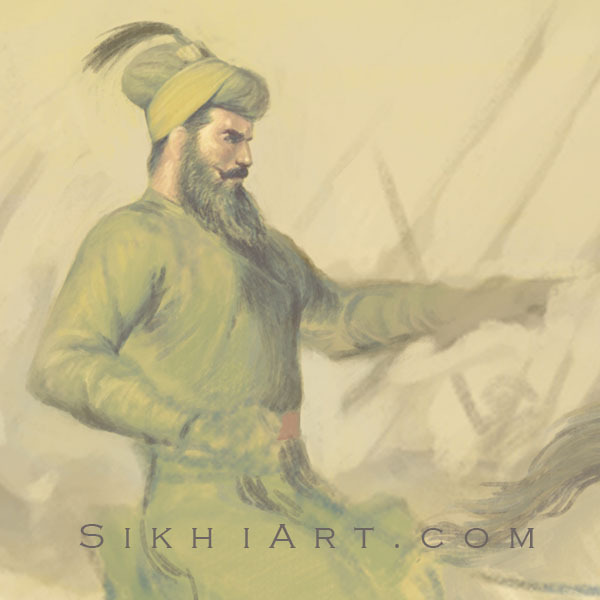 He called for his sikhs to give their heads while his sword glistened in the sun. The first five to give their heads were known as the Panj Pyarey. This sketch shows Baba Banda Singh Bahadur, previously Guru Madhav Das, heading to battle along with sikh soldiers. Unlike Guru Gobind Singh ji, Banda Singh ji recruited many jatts into his army, and this lead to a snow-ball effect right into the city Sirhind. Based on the British sketches of Nihangs marching to battle. 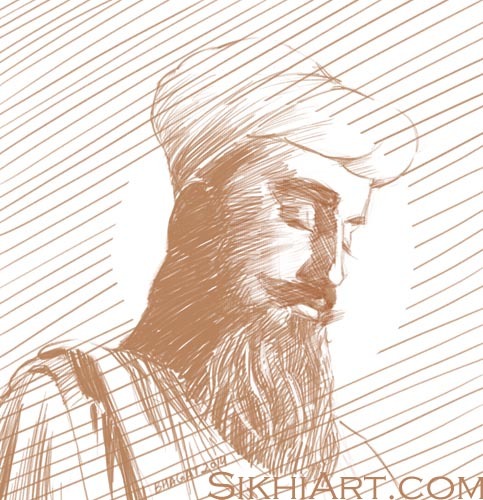 The sketch that lead to the creation of the famous painting of Hari Singh ji Nalwa. The sketch that lead to the creation of the well-known painting of Guru Gobind Singh ji in Machhiwara. 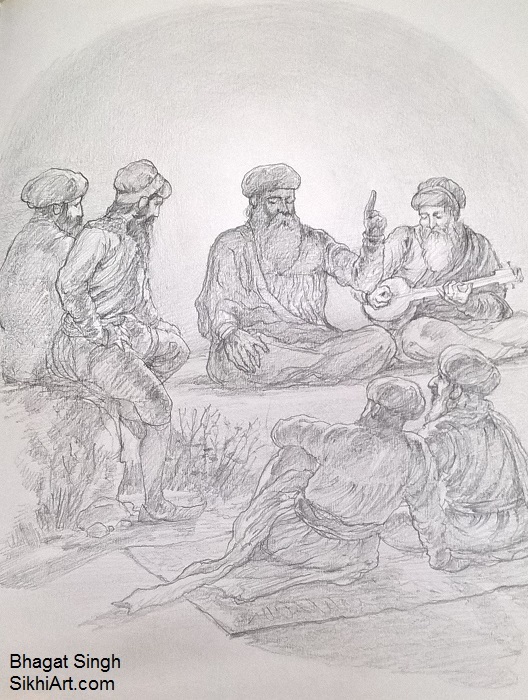 The sketch that lead to the creation of the painting of Akali Nihang General. Guru Gobind Singh ji escapes from the city of Anandpur under the Mughal pressure. 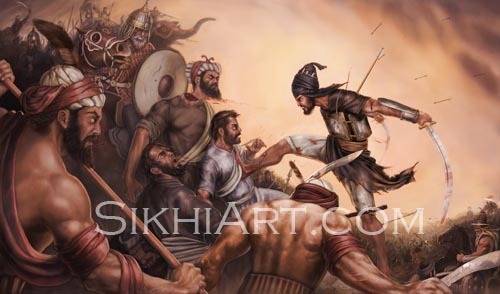 Him and 40 of his sikhs come to rest in a haveli at Chamkaur, however the Mughals continue pursuing them and this results in the Battle of Chamkaur, which wipes out everyone except for Guru Gobind Singh ji, who escapes into the Machhiwara jungles. Hind di chadar Shri Guru Tegh Bahadur ji was previously known as Tyag Mal. 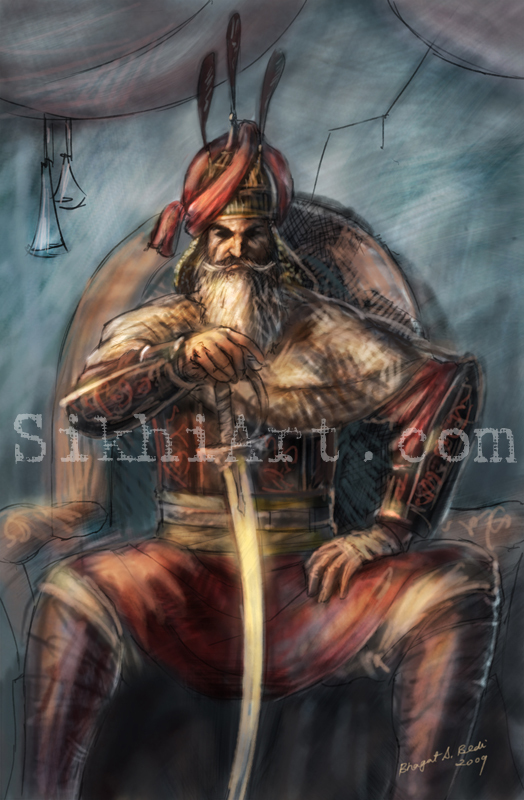 However upon displaying martial prowess on the battlefield, came to be known as Tegh Bahadur, at young age. Later he resigned to small house in Bakala, where he meditated until he was discovered by Makhan Shah, and took the Gurgaddi after Guru Hari krishan ji. Gurus always said everyone follows faith blindly without understanding. So they tried to instill understanding in everyone. To the Gurus, hindus, muslims, christians, now sikhs, everybody was the same, they are all ignorant of God. That’s how the prophets also saw the people. Jesus said on the cross, “forgive them, Father, for they don’t know”. To the Gurus, no religion was a hurdle. It was ignorance of God that was the hurdle. That’s why the Gurus always focused on ignorance rather than religion. In 1661, Guru Hari Krishan ji received the gurgaddi from his father Guru Hari Rai ji, after his passing. 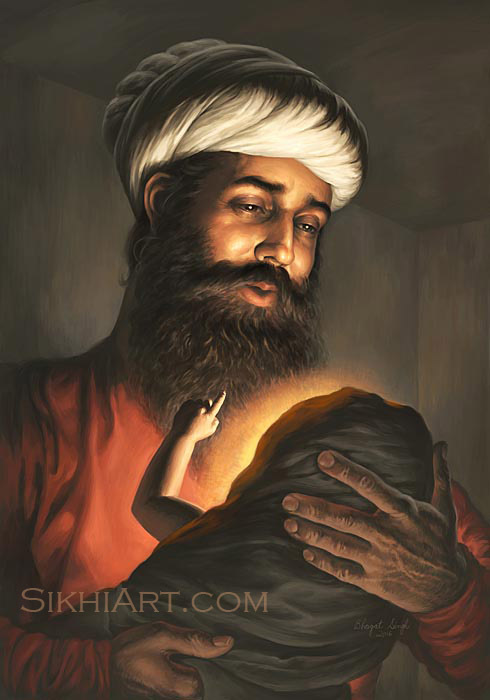 Guru Hari Krishan ji came to be known as the Bal Guru, child guru. At the age of 8 he passed away due to smallpox. Gurudwara Bala Sahib stands on the location of his cremation. In this sketch, he is wearing the classic 17th century Dumalla, along with kalgi, chola and mala. On his cheeks, flows curls of hair. This is a typical depiction of Guru Hari Krishan ji and even young Guru Gobind Singh ji that is seen in the paintings of their times. 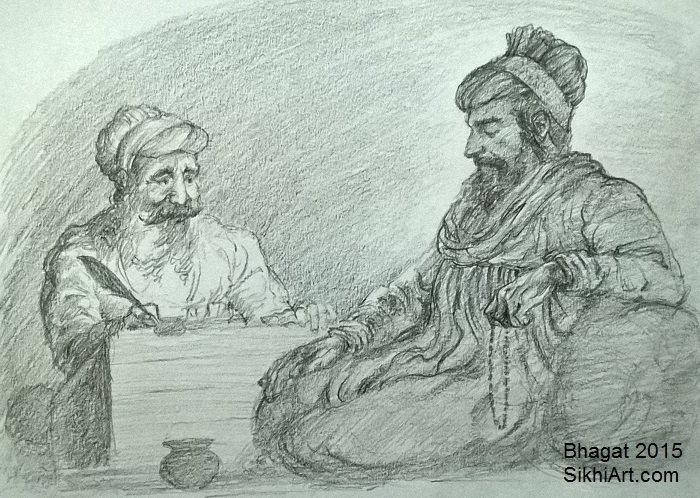 In this sketch Guru Arjun Dev ji, with his scribe Bhai Gur Das ji, compiles the poems and teachings of various Indian mystics. 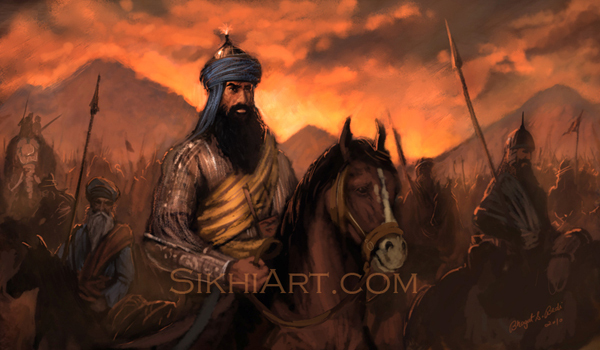 After the martyrdom of Guru Gobind Singh ji’s sons, Guru Sahib having no heir to the Gurgaddi passed the torch back to the granth that was compiled by his great grandfather, Guru Arjun Dev ji. From that moment on, this compilation of teachings came to be known as the Guru Granth Sahib. 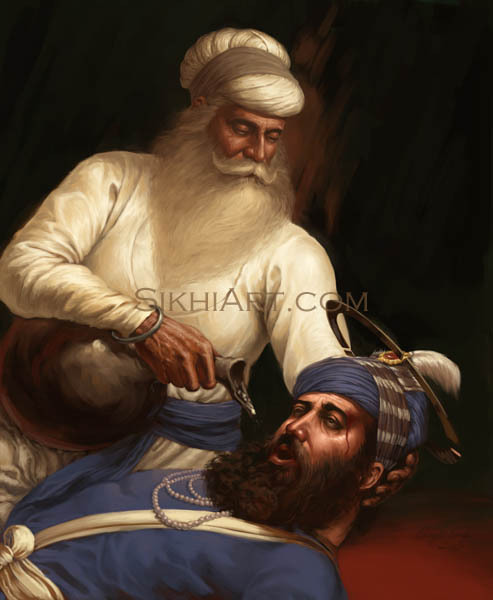 Baba Deep Singh ji sacrificed his life Hari Mandir Sahib, along with about 500 men he had gathered to defend the temple from Afghani invaders. The almighty has blessed these true painters…..keep it up guyzz…looking forward for many more masterpieces..
Actually I don’t understand what is your motive to show these pictures. One side Sikhism are not believe in the Guru’s picture and you shown these picture Guru’s are very similar to a real men. I don’t know who is in picture but I am sure this is not my Guru’s. And how you know that Guru Nanak Dev G looking in young age like that. I am merely a vessel through which Waheguru is creating paintings. And the reason why I trust him, is because he is guiding me to knowledge. And this is knowledge that most Sikhs and Sikh painters are not aware of. A simple example of this knowledge is the dumalla style. No other artist knows how to paint a puratan dumalla that Guru Sahibs wore. I know what a puratan dumalla is and I know how Guru Sahib’s tied their dastaars. I am ignorant but I know only because Waheguru has shown me the way and he is getting me to paint these pictures the way he intends them to be. Bhagat bedi ji sache patshah tuhaannu chaardikala ch rakhe………. That is Hunkaar talking and not you. And you are also so very wrong about the way the Khalsa wore the dhumala. 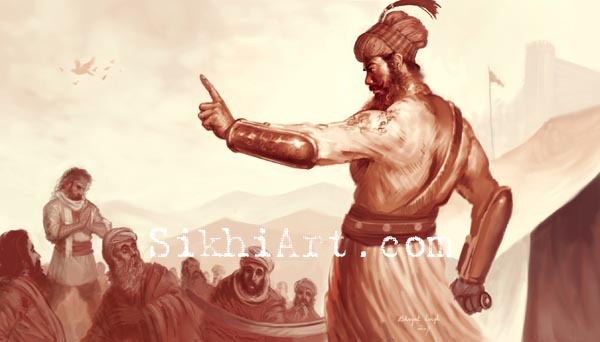 Civilians men tied the dastaar the way you have painted but not the Khalsa, you should do more research on this topic, best way is to meet the elders of Nihang jathebandhis and talk to them. 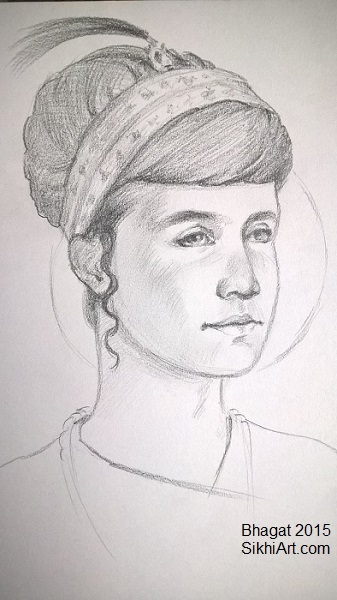 You are really doing great work, this is also parchaar, I also draw and paint but I give my work away for free. You are thinking of the Nihang’s Boonga style dastaar. 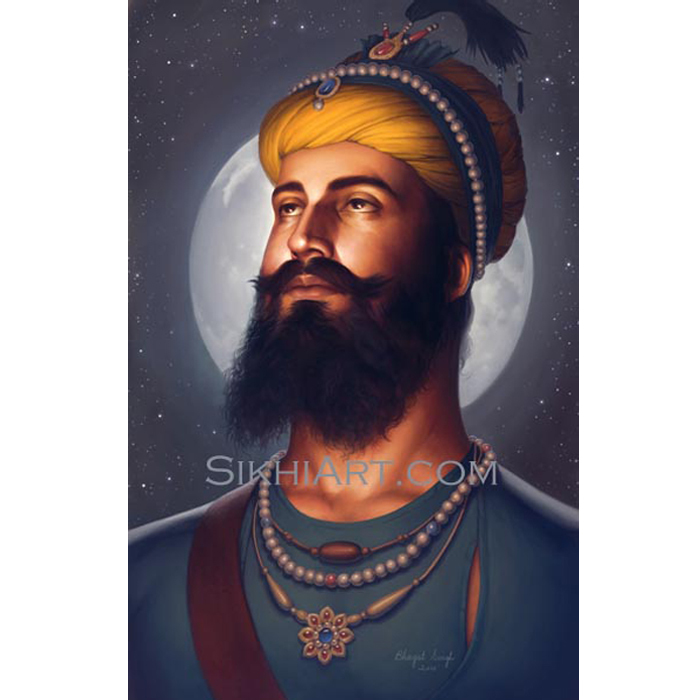 It emerged much later during late 1700s, many decades after Guru Gobind Singh ji passed away in 1708. Guru Gobind Singh ji did not tie this style. The style of Dastaar that Guru Gobind Singh ji tied, while he was around in the 1600s, was much different from the Sikhs (including Nihangs) in 1780-1800s. This style I call the Puratan Dumalla. This is what I have painted in my portrait of Dashmesh Pita ji and then again in the painting of Banda Singh ji Bahadur. Dastaar styles have changed over time. New trends emerge, older trends die out – it is nature. I must agree there is a lot of hunkaar in your post, if you feel waheguru has blessed you with knowledge that is great but to use it for personal gains of the magnitude you are commanding on here is ironic. Furthermore the clear endorsements of hindu deities is a strict conflict with fundamental sikh principles. If you care about the sangat then you should allow the sangat to volunteer how much they pay you for your reproductions not demand a fixed price in the hundreds upto thousands. No one knows what the greatest of great gurus looks like and to be honest we dont need to know, we need to follow their words and scriptures not the kalpana of artists. I notice you also endorse tattoos which again are anyi sikh as they require hair to be removed from the body, you have works of hanuman and shivji…lets recalibrate on the following ram rahim puran quran anekh kahe math ik na manyo…. Your ability as an artist is fantastic use it to help people get back into sikhi not to delude them with your fantasies of what the gurus looked like and stop painting hindu mythological creatures like hanuman we do not accept these creatures as god god has no form no beginning and no end. I have ahankar that’s why I have attached myself firmly to Guru ji. That’s why I place my trust in Guru Sahib, to guide me towards the right decisions. Guru ji commanded me to make paintings of Sikh itihaas, Gurus and mythology, paintings of Gods. As he commands, I do. I am the vessel through which he fulfills his command. The sangat can always negotiate the prices and have been doing since I started painting. If you can’t pay what I have listed here, you can contact me and we can work out a price that works for you. Exactly, no one knows what our Gurus looked like, no one knows what our Warriors looked like. That’s the challenge that I face when I try to think about what they looked like. I need to know what they looked like. So I do my best to find out about Guru’s paintings from their time as well as their clothing and turbans of their time and I paint them to my best understanding. 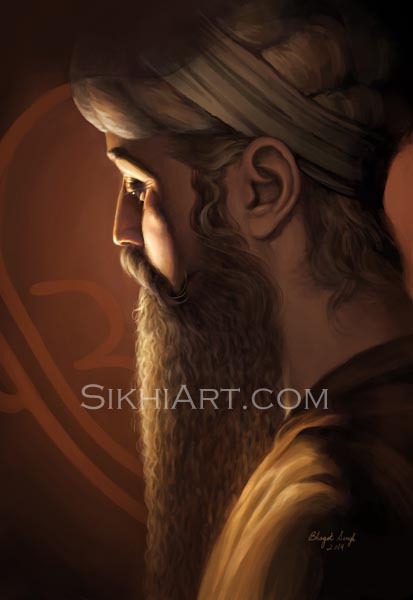 My paintings have helped millions of Sikhs to connect to Sikhi. They even helped you to think about the Gurus and their teachings as you were writing your comment. Veerji most people don’t know this, however, the dumalla we wear today is different than the style Guru Gobind Singh ji wore. I looked at Guru Sahibs paintings that were painted during 1600s,1700s and 1800s and my painting of Vaisakhi and Dashmesh Pita, show the accurate style that Dasam Patshah wore. Waheguru jii!! you are blessed with amazing talent!! !Beautiful art… speechless!!! There is so much negativity in responses. Stop judging. Everyone has the right to their opinion but to be so judgemental.its wrong. 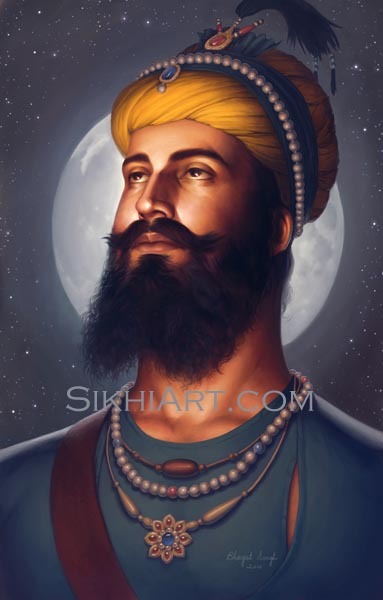 Instead STFU and appreciate what talent is bestowed upon this man he could have painted anything…naked women, or whatever but instead chosen to paint Sikhism. We were taught to treat with respect and instead we become egocentric. So many youngsters font go to the temple due to these politics. If we are to leave comments….instead leave ones staying how beautiful the paintings are. The peace in the eyes. The hues that sooth. You don’t like it…….don’t look at it or buy it. May Waheguru bring you all some peace. Wish I had an iota of blessings which you are enjoying being this vessel. I have 1 of your paintings in my house and every morning Guru Arjan Dev patshah thru your painting ask me how much of the real essence of Gurbani he is beautifully reciting to Bhai Gurdas ji I have understood and implemented in my life. Stay Magan (steadfast) on this path and bestest wishes !! Hello Bhagat Bedi! not much has been written about the Sikh paintings in literature, and so i want to do a research on Sikh paintings. Also i want to know the origins of Sikh paintings, their style etc. Any articles/books or other sources of information that u can suggest me pls? Bed I ji, keep up your good work. You will always find some one to criticise you no matter what you did! Just thank them. Awesome keep going ahead may guruji bless you. After having a look at these painting i felt like they are really in front of me. sir you have good talent but you have not make photo very clear. you have used a little of blue color in your paintings and it all over bhanwan color in your total paintings even everywhere in the paintings that is considered at present to be the color of r s s and modi regime an attack on sikhism through badals. in a painting you have shown back of a dhaal which is clearly showing the ganesh mouth the two eyes and a sund in a very artistic way in a painting you have shown bhai ghaniaa ji serving water to a fallen sikh and there is a bhangwan bad z on his turban and a kalgi that is not true true image of a sikh it is only weard by the guru himself and selected prominent sikhs. so there seems reason to use the bhangwan in your paintings. singh sahib try go through the paintings of bhai sahib bhai sobha singh, bhai jarnail singh ji and great painters. your photos/painting do show any jalal over the faces of gurus as well as othe sikh generals nothing is there in the paintings to attract sikhs to buy your painting. do not use bhangwan color and involve any hindu elements if you want to inspire sikhs to buy your paintings. you have the ability and great talent required for this art. to get the price of your paintings is your right because you are doing very hard job. i don’t ask you sell them free as no sikh in world i have seen or heard to do this or other job complimentary for the sikhism. so do very good job and earn very good by selling your art. you are not defrauding any body by selling this. god bless you ji. Excellent work! 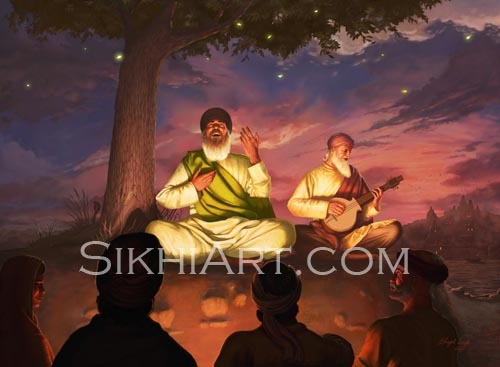 For all the haters that have an issue with this artwork being sold – Kirat Karo, which means to earn an honest, pure and dedicated living by exercising one’s God-given skills, abilities, talents and hard labor, is an important pillar of Sikhi. Thus, one should have nothing but respect for this artist! I think you’re painting are excellent. You capture the mood and the emotions very well. My only criticism is these painting depicts alot of pain, suffering and aggression. Although this is very important, I would like to see more of our Gurus are at peace, meditating and engaging with their followers. Nevertheless keep up with your excellence. Look forward to your new creations. Sir you are the one that has hankar. Bhagat Bedi is doing such a beautiful thing here, these paintings are something that comes from inside him. And I’m sure for someone like him who who has so much love for our Gurus doesn’t mind ur harsh words as he only cares about his gurus guiding him to do such beautiful work. Keep up the great work Bhagat !! Hardeep Singhji: please grow up and get a life. 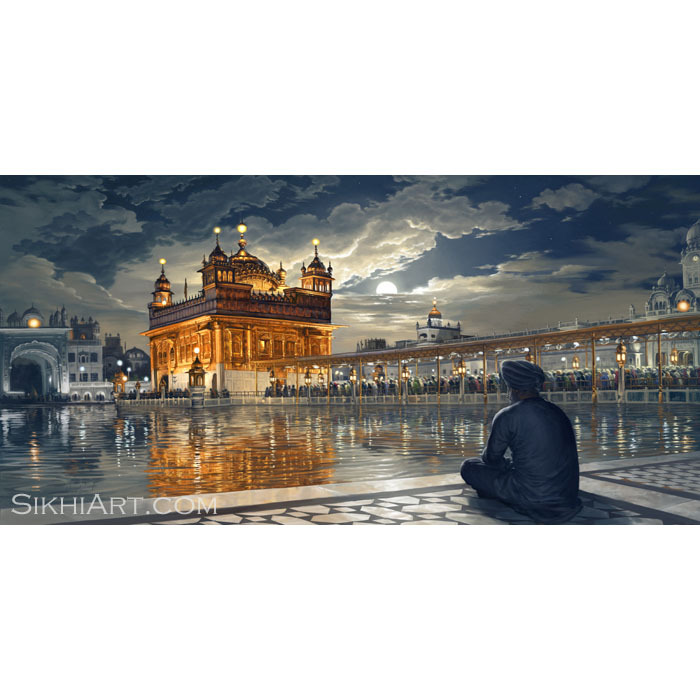 Begin by learning about Sikhism. Your Gurus are a figment of your fantasy. 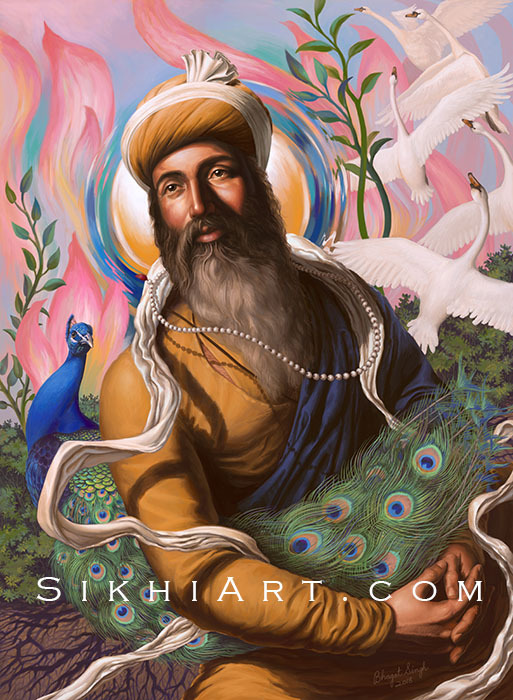 The Sikh Gurus were Men chosen by God to enlighten mankind. To purchase prints click on Buy Prints > and then select the Print you want and the size > then Check Out. And sikhart is doing nothing bad by doing so. Take it as an appreciation for someone who is doing the community something good. Free donation at your own cost cannot be done for long time. Beautiful, emotionally passionate work. It captures the eye and the soul of the viewer. It does what all great art does: makes us think and makes us reflect on what we believe and what we perceive. Never mind the naysayers. There is no moral failing in painting gurus and religious figures. You’re not trying to paint the Divine, only His reflection in all of us. Our gurus never proclaimed they were God. And God, as you already know, can never be captured in visual form. For if He was able to be defined, He wouldn’t be God. So, continue pursuing your gift without fear. All the Best.